I’m a 56 year old man who does not take very good care of himself (but I’m trying…). As part of a weight loss program, I’m using a protein powder from Costco. Lately, I’ve been freezing fruit and making my smoothies with the powder, frozen fruit and orange juice. Tonight I thought to add some veggies to it and put in some frozen spinach. It was pretty good, and I sure more beneficial that fruit, only. I’ve heard that kale was a very good vegetable to use. When I read up on it, I discovered that steamed kale was better that raw kale. How would it be if I steamed the kale and then froze it for later use in my smoothies? OK, first of all I want to say this is where we enter the category of so much confusing nutritional information out there that people throw their hands up in the air and give up. Ultimately kale is incredibly nutritious raw or steamed. I did do a lot of research on this and the debate seems to be split 50/50. Here is a great blog article. Cancer studies for example show that raw kale is more beneficial than cooked and cholesterol studies show that steamed kale is more beneficial than raw. It just depends on the study and what they set out to prove. T. Colin Campbell’s book, Whole: Rethinking the Science of Nutrition, is a really interesting expose on how nutritional studies get funded and researched. So, don’t give up or throw in the towel, if you are eating kale raw or cooked, 5 gold stars. I love the idea of steaming it and using it later frozen for your smoothies. This is a fantastic alternative to frozen fruit for keeping your smoothie cold! 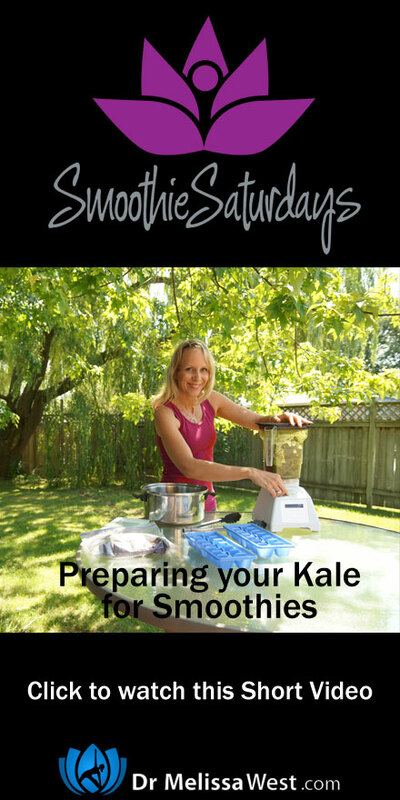 So let’s get into why you might want to steam your kale and how to prepare them for easy future use in your smoothies. First of all, I do want to point out contraindications for kale. If you are taking blood thinning medications kale might not be the best idea for you because kale promotes clotting. The greens contain oxalates which in lab tests have been associated with kidney stones and some gallstones so check with your medical doctor before you consume tons of kale. Also kale contains a compound that can suppress thyroid function in certain people. Some say that cruciferous vegetables such as broccoli, cauliflower, collards, brussel sprouts, cabbage, mustard greens, kohlrabi, turnip, and kale, should always be cooked because they can disrupt thyroid hormone production. They do this by blocking thyroid peroxidase and disrupting messages that are sent across membranes of thyroid cells and cooking these vegetables greatly reduces these negative effects. So if you have thyroid issues, then it might be a great idea to look at lightly steaming your leafy greens. 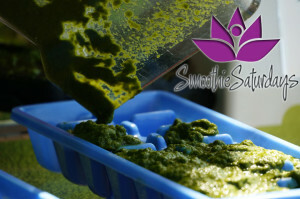 One of the main benefits of lightly steaming your greens is that you will destroy toxins microorganisms. Pathogenic bacteria will be killed when exposed to heat. This is great news! So let’s look at how we are going to do this. I had some collards and kale I needed to use up in my fridge before my next green bin of organic produce arrived today, so it was perfect timing. Kale crops are often sprayed with pesticides. I believe they might even be on the dirty dozen list, so if you can, be sure to buy organic and wash well! Previous post: ​Yoga with Melissa 189​: Yoga for Purification, Durga Series: Maha Gauri. Next post: What is a kriya?